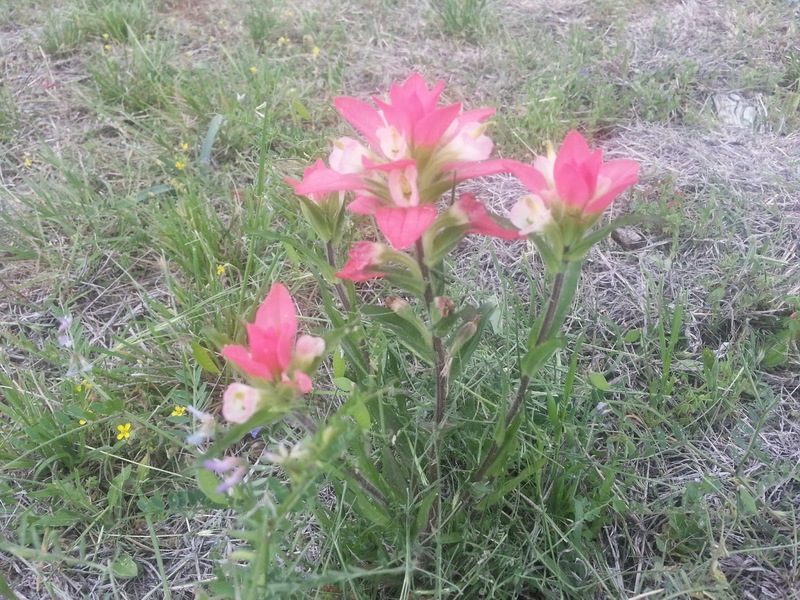 When my husband mowed our five acres for the first time this spring, he carefully maneuvered the big mower around this wee wild flower growing in front of the house. Some of our neighbors' yards were filled with a glorious show of Blue Bonnets and Evening Primrose. We only had the one. But we thought her quite lovely. I wonder if she looked around and felt somehow "less than." After all, people didn't drive by, place their children beside her and snap pictures. No one walked along our street and stopped with wonder at the sight of her. Did she long for just a little more recognition? After all, she was doing her very best. Did she feel it just wasn't enough? I've had more than a few moments of feeling exactly that way. In this internet world, where fifteen minutes of fame can come to anyone and numbers reign supreme, it is easy to feel "less than." In this season where we are told over and over again we must go and do great works for the Lord, where quietly doing the hard work of home and hearth doesn't seem to measure up, it is easy to feel we aren't doing enough. More than once I've heard my ninety year old mother wonder out loud why she is still here. She feels her life doesn't count any more. She believes it isn't enough that she cares for my ninety-four year old father; that she writes cards and notes of encouragement to everyone she knows (and some she doesn't); that she sews little quilts to take to the nursing home; that she is always there for every one of us, dispensing love and wisdom from a wise and generous heart. It makes me sad to hear her say those things. I think it may be time to celebrate those unsung heroines in our lives - not just on the one day we set aside each year - but every single day. One of those heroines in my life was Aunt Ethel. She wasn't really my aunt. She was everyone's aunt. She first came into my life when I was eight years old. I think she must have been in her late sixties, with wavy white hair and smelling of lavender - a grandmother who had lovingly raised a daughter and now had time to pursue her dream of starting an organization in our church just for girls. She called the organization C.G.I.T. - Christian Girls In Training. We met every friday evening. The girls ranged in age from eight to eighteen. She and a small group of women (my Mom included) taught us everything from scripture to sewing. We sang, played games like Upset the Fruit Basket, memorized whole chapters of scripture, and listened to Aunt Ethel teach from the Word. We camped out, put on plays and every Christmas we did a special Christmas Program. I can still see us - lined up from smallest (me among them, the first year) to the tallest ( my very last year) with our lighted candles circling the darkened sanctuary of our little church. She had a profound influence on my life. She was a lovely combination of disciplinarian and nurturer. I can still remember the times she had to have little "talks" with us for one reason or another. To this day I never use the word "Holy" in a flippant way. She instructed us, in no uncertain terms, it should be used only to describe our Lord. And I remember her laughter and a smile that just lit up her face. Although the internet was something we never dreamed of in those days, I don't imagine she would have had a FB page or a Twitter account. She simply had a passion for influencing the lives of young girls for the Lord. No one gave her an award or wrote the story of her life. She was a wife, mother, grandmother and mentor who lived a life rich in the things that are of eternal value. When she went to be with the Savior she dearly loved, I know she heard those precious words, "Well done, good and faithful servant. She must have smiled her lovely smile. What about you? Is there an unsung heroine in your life? I would love to know her. Perhaps you'd like to tell us about her in the comments or by leaving a link to a post. I have some others I'd like to tell you about some time. They are the women who are making a difference for eternity in the hidden places. o celebrate those who don't seek the spotlight but simply serve, faithfully, quietly...they are heroines indeed, for they shape and love us. Thank you for drawing attention to those who would probably be embarrassed by it! I enjoyed this story. Thanks for sharing it, Linda. I enjoyed this so much, Linda! I am definitely one of those who feel "less than". But then I remember the words of a Bible teacher, "We can pray for others." There was a lady who taught the children's class when I was little, (most people didn't really approve of some things she did) who I credit for a lot of the knowledge of the Bible I had as a child.